Our Organic 4 Tier Sky Blue Reverie Diaper Cake can be easily mistaken for a wedding cake! 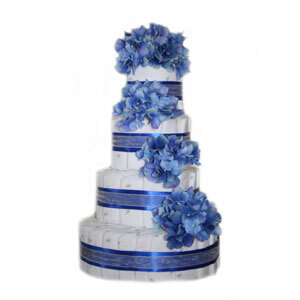 Decorated with gorgeous high end ribbon and blue toned hydrangea, this diaper cake will make the most exquisite centerpiece at a baby shower. Guests will find themselves marveling around it since it looks so deliciously beautiful, not to mention, it will be the most memorable gift for the expecting mom. Bring this diaper cake along with you when visiting the new mommy at the hospital, it sure makes a more unique baby gift over the usual bouquet of flowers. Completely made from scratch, this GrowInStyle exclusive diaper cake is made with approximately 80-90 Nature BabyCare Eco Friendly Diapers (Size 1).